2000 Sharp SH-1224 12” x 24” Automatic Hydraulic Surface Grinder s/n 0011F-04 w/ Sharp Controls, Automatic Cycles, Wheel Dresser, Fine-Line Electromagnetic Chuck, Coolant. Thompson 6” x 18” Automatic Surface Grinder w/ Suburban 5” x 10” Magnetic Chuck, Wheel Dresser, Coolant. 2003 Ingersoll Rand IRN50H-CC 50Hp Rotary Air Compressor s/n NV1459U03155 w/ Intellisys Digital Controls. 2003 Ingersoll Rand TMS0280 Refrigerated Air Dryer s/n 42528885. Gardner-Denver mdl. BACABUC 25Hp Rotary Vane Air Compressor w/ Precooler, 120 Gallon Tank. Sullair SRD-105 Refrigerated Air Dryer s/n 003-D11472. 400 Gallon Air Storage Tank. Hammond Roto-Finish Gemini Extended Range Series 48” Media Tumbler s/n G-700- 00-B14. Roto-Finish 21” Media Tumbler s/n ST-1C- 00-A22. Willett Systems mdl. 3820 In-Line Inkjet Printer w/ iMage S8 Master Controls. 2012 Thermo Scientific Heratherm OMH400 250 Degree Lab Oven s/n 41393406. Quincy Lab mdl. 40GC 1500 Watt Lab Oven. Kelvinator Scientific mdl. UC460-A14 Freezer s/n W11F-311971- XF. Minster-5 50 Ton OBI Stamping Press s/n 5D-101- 20831 w/ 18” x 28” Bolster Area, 14” x 24” Ram Area, Crank Tilting Adjustment. IPC mdl. TTM-HS2 12-Station Rotary Vertical Injection Molding Machine s/n 10262 w/ IPC Controls, 25”Diameter Turret. IPC mdl. 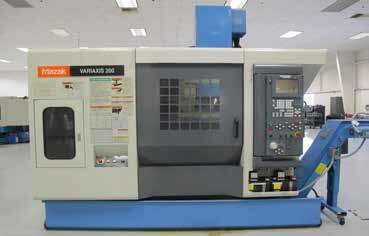 TTM-HS2 12-Station Rotary Vertical Injection Molding Machine s/n 10181 w/ IPC Controls, 25”Diameter Turret. Novatec mdl. MD-15A Drying Hopper s/n 3-9305- 1757. Novatec mdl. MD-15A Drying Hopper s/n 3-9054- 1726. 2001 Hitachi Seiki Super HiCELL 250 5-Axis Twin Spindle Super Productive Integrated Machining Cell Type CH250 s/n CH20170 w/ Hitachi Seiki Seicos Σ16T Controls, 30-4000 Main and Sub Spindle RPM, 10”3-Jaw Power Main Chuck, 8” 3-Jaw Sub Spindle Power Chuck, “C” Axis 0.001 Degrees on Main and Sub Spindles, (2) 20-Station Tooling Magazines, KV-45 Taper Tooling Pot, Live Milling thru Main Head, 80-8000 Live Milling RPM, Milling Spindle Rigid Tapping, Parts Catcher, High Pressure Coolant, Mayfran Chip Conveyor. 2001 Hitachi Seiki HiCELL23 II Super Productive Integrated Turning Cell Type CA23 II s/n CA25344 w/Hitachi Seiki Seicos Σ18T Controls, Tool Presetter, 10-Station Turret with KV-45 Taper Tooling Pots, 12-Station Tooling Magazine, 4000 RPM, Tailstock, 10” 3-Jaw Power Chuck, Parts Catcher, Mayfran Chip Conveyor, Coolant, LNS Quick Load Servo S2 Automatic Bar Loader / Feeder s/n 301152 w/ LNS Digital Controls. 2001 Mazak Super Quick Turn 100MS Twin Spindle Live Turret CNC Turning Center s/n 156505 w/Mazatrol PC-FUSION- CNC 640T Controls, Tool Presetter, 12-Station Live Turret, 6000 RPM Live Tooling,Full “C” Axes on Main and Sub Spindles, 6” 3-Jaw Main Power Chuck, (NO SUB SPINDLE CHUCK), (4) Live Turret Tooling, Parts Catcher, Tsubaki Chip Conveyor, Coolant, LNS Quick Load Servo S2 Automatic Bar Loader / Feeder s/n 301183 w/ LNS Digital Controls. 2000 Eguro Nuclet-10GL CNC Gang Tooling Cross Slide Lathe s/n 4161 w/ Fanuc Series 21i-T Controls, 5000 RPM Spindle, 5C Collet Closer, 7 1/8” x 30 ¼” Table, Gang Tooling, Coolant. Schaefer Megomat ASM3001U Wire Processing Machine w/ Straightener, AMP Crimp Quality Monitor,(2) APE300 Crimping Presses, OES CFM5000 Crimp Force Meter, Schleuniger “Wire Stacker 1000”,Conveyors. (3) AMP Champomator 3A Semi-Automatic Cable Terminating Machines. Nanometer Technologies Fiber Optics Polisher. (55) KV-45 Live and Taper Tooling. (8)Lista 11-Drawer, 10-Drawer, 8-Drawer and 6-Drawer Tooling Cabinets. (3) Snap-On Roll-A- Way Tool Boxes. Busch and Gast Vacuum Pumps. Giddings & Lewis Cordax Discovery Series mdl. D12 CMM Machine s/n P-1041- 0998 w/ Renishaw MIP Probe Head, Remote Servo Controller, 18” x 30” x 15” Work Envelope, PC-DMIS Operating Software, Roller Stand. Mitutoyo 6” Digital Caliper, 12” and 6” Dial Calipers. Mitutoyo 1”-2” and Import 2”-3” Thread Pitch Mics. Mitutoyo 0-1”, Starrett 1”-2” Blade Mics and Mitutoyo 0-1” Disc Mic. Starrett and Mitutoyo 0-1” Anvil Mics. Mitutoyo Digital Drop Indicator and Blake Universal Indicator. Thread Ring and Plug Gage. Vermont Pin Gage Sets .625-.750, .501-.625, .251-.500, .061-.250, .011-.060. Starrett Crystal Pink 24” x 24” x 6 ½” Grade “A” Granite Surface Plate w/ Roller Stand.